This impressively large bouquet of Oriental Lilies will fill the house or office with a subtly intoxicating fragrance whilst pleasing the eye with its delicate pastel tones.Lilies may be sent closed/partially closed in order to prevent damage and to last longer.The featured vase is not included however; for a lasting impression we recommend a Superior Vase which is the ideal selection for these Oriental Lilies. I'm in Mexico and send flowers to Thailand. Very easy to do, the chat online solve your questions and really help you with the tracking. The product as appear in the catalog in good conditions and everyone happy. Thanks !!! My partner was very happy with the flowers she received and overall so was I. The teddy bear wasn't the colour I ordered and the wine isn't what I would have expected from a sparkling white and there were too many 'reminder' emails even after I had ordered but at the end of the day my other half thought it was a lovely surprise and she was very happy. excellent and all organized from Sydney. 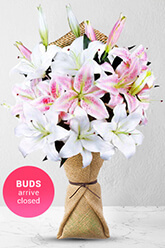 The flowers were wonderful and ordering online and delivery the same day was terrific. Very easy to order and a satisfied customer! I have used zFlowers.com on two occasions now. The online service is user friendly, service is prompt and flower arrangement amazing. Thank you! Would be better if a delivery notification was received without having to call the call-centre.